Memorial Day Weekend is about to begin, and so is the start of the movie & barbecue season. Over the next few days, I'll be posting a few healthier versions of picnic and barbecue favorite recipes, with lighter and decidedly more veggie friendly ingredients. I love the side salads almost as much as I love the hamburgers, hot dogs, ribs, barbecue chicken and grilled steaks. The problem with all of this kind of food is that it's fattening, full of bad for you stuff and packs on the carbs. I often feel bloated and carb over-loaded, leaving me with a food-hangover and craving more. This recipe is nothing too new or difficult. Another one of those "Why didn't I think of this before?" kinds of recipes, with infinite variations. 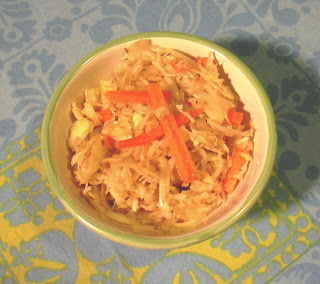 My particular version is a quick Asian Style Health Slaw - nearly fat free and oh so tasty. For an even simplier version, use a pre-cut bag of coleslaw and a good bottle of fat-free or light salad dressing. Paul Newman has a light Sesame Dressing that is out of this world! Feel free to chop your own cabbage - like a nice Napa or softer Asian style cabbage, as opposed to the crisper heavier bowling ball heads of white or pale green cabbages. Or buy the pre-cut/shredded coleslaw mixtures found in the produce aisle near the bagged salads. The pre-cut cabbage mix is quick and easy and cheap - words and foods I like! Put coleslaw mixture into a large bowl or container. In a mixing bowl or cup, combine the vinegar through the freshly ground black pepper, and whisk thoroughly. In a slow steady stream, whisk in the sesame oil. Pour the mixture over the coleslaw mix and toss to combine. Sprinkle the sesame seeds into the coleslaw and toss to combine. Taste and adjust seasonings, adding more vinegar, soy, pepper, etc. Keep in mind the coleslaw will release some water as it sits - so use salt or soy sauce sparingly when adding more to the mix. Refrigerate at least 20 minutes to overnight. When ready to serve, toss well. Serves 8 as a side salad.